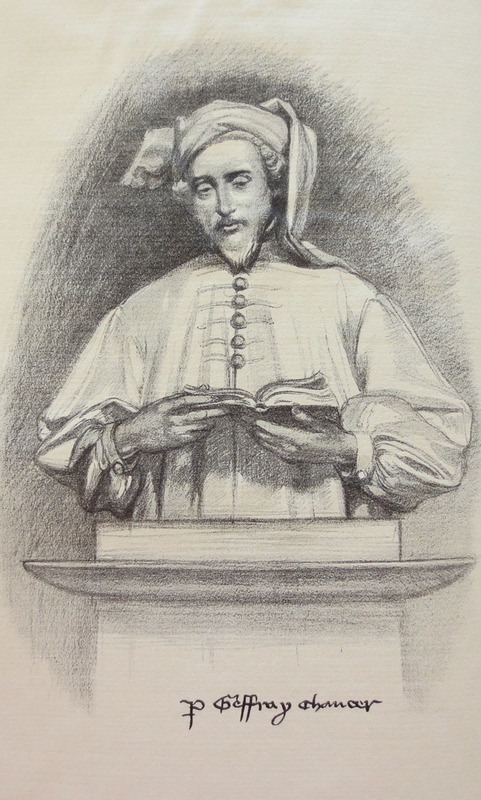 Geoffrey Chaucer pursued many occupations during his life: soldier, diplomat, intelligence officer, construction supervisor, Controller of Customs, and member of Parliament. Yet, it is for his literary accomplishments that he has achieved enduring fame. The Canterbury Tales, never completed, represents his magnum opus and the crowning achievement of his life. He began work on The Canterbury Tales about 1387, and intended for each of his thirty pilgrims to tell four tales, two while traveling to Canterbury and two while traveling from Canterbury. However, only twenty-three pilgrims received a story before Chaucer's death in 1400.
. . . it has been said of The Canterbury Tales that all of humanity moves through its pages. The stories are full of an inimitable humor, at once friendly and shrewd. The points are often made casually, often with bludgeon strokes, but they are always human and illuminating. Emerging from the manuscript tradition, early printed editions of Chaucer borrowed heavily from the elaborate illustrations found in manuscript copies. This tradition has continued throughout the history of Chaucer editions, until the twentieth century when production costs and larger press runs made illustrations prohibitively expensive.